Slieve Donard is the highest mountain in Northern Ireland and in 9-county Ulster. St. Domhangart (modern form Dónart), a contemporary of St. Patrick, founded a monastery at Maghera north of Newcastle. According to tradition he was appointed by St. Patrick to guard the surrounding countryside from the summit of Slieve Donard. He is supposed not to have died, but to be a 'perpetual guardian' (see MacNeill, 84-96). In pagan times this mountain was known as Sliabh Slainge. Slainge, the son of Partholon, was the first physician in Ireland. According to the Annals of the Four Masters, he died in Anno Mundi 2533 (2533 years after the creation of the world according to Irish mythology) and was buried here in a cairn. 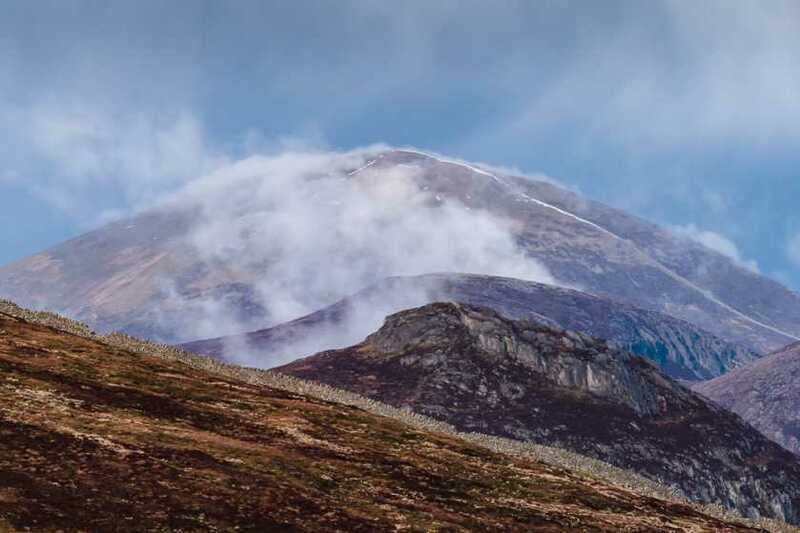 On the top of Slieve Donard there are two cairns, one on the very summit and the other, called the 'Lesser Cairn', on the Ordnance Survey maps, some eight hundred feet to the north-east. Both of them have been much disturbed. The Summit Cairn has been tampered with by sappers and water commissioners: the Lesser cairn has small piles of stones about it, but it is difficult to say whether these are ancient structures or just re-arrangements by modern hands. Dr. Estyn Evans, who calls the Summit Cairn 'the oldest mark of man in the Mournes', says that it is a 'corbelled passage grave of the early Bronze Age.' The Lesser Cairn, he points out, is visible from the sandhills of the shore, although the Summit Cairn is not (MacNeill, 85). Slieve Donard is the highest mountain in the Mourne Mountains area and the 19th highest in Ireland. Slieve Donard is the highest point in county Down.